Ops Kingfisher kicked off to a rousing start with lots of slopes, hills and thrills. After a good rest from Sundown Marathon end May, the trainees were anticipating some solid workout to rev their engines up for the Army Half Marathon in 6 weeks time – and they were not disappointed! That being a rather new location to some, plus the ongoing bout of flu that has hit some participants, the 70% turnout was not bad. The participants were not disappointed as they went for some neat hill repeats, that after being served a 3km appetizer of a run-up to the MF Hills, and then rounding off with a dessert of slopes yet again before finally settling back at the Clubhouse. Some of the participants had jello legs after, while others claimed to have trouble finding theirs. Overall, it was a great experience for all, and the sense of satisfaction worn on the Kingfishers’ faces told a story on one unforgettable hills training menu. There were a few enquiries about whether it is too late to join Kingfisher – the short answer is you will still benefit from the 6-week structured training program with the opportunities to do your own make-up training following the schedules, if you have missed a couple of earlier sessions. Thus, if you have no training programs for AHM, do REGISTER for the remaining Ops Kingfisher slots HERE! 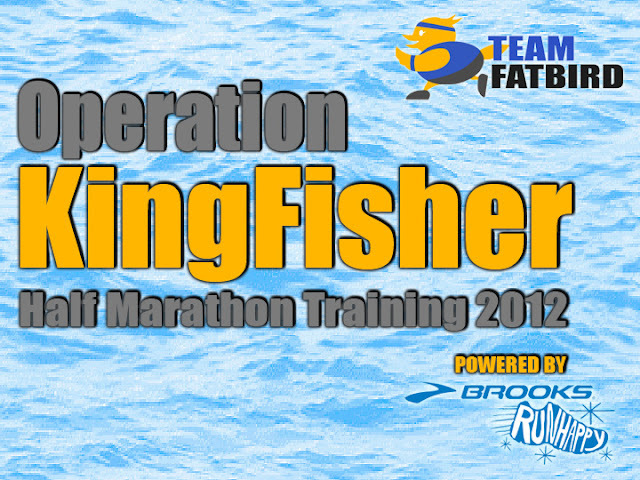 Operation Kingfisher 2012: Rev The Engines! Training Starts From July 25! 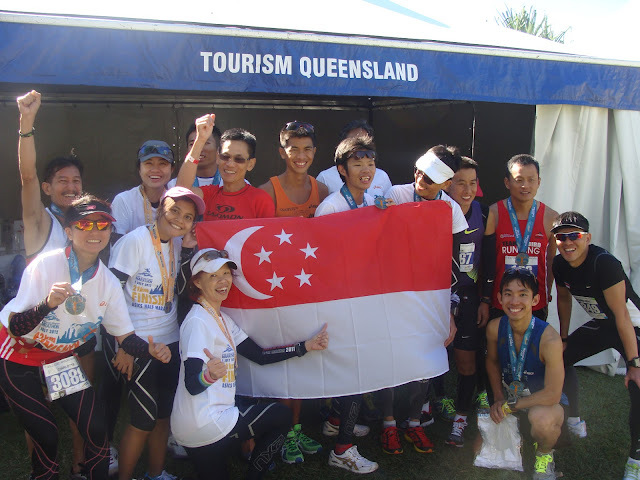 With the successful completion of major events like the Sundown, KL and Gold Coast marathons in H1 2012, are you lining up the race calendar for the second half of the year? If you have signed up for the Army Half Marathon, we have a couple of remaining slots for the 6-week (10-session) structured half-marathon training program remaining. Wait No More! The 6-Week structured training (10 group training sessions) Operation Kingfisher 2012 Program brings them all together – an integration of the best for 10km and 21km training of speed, track, hills, trails. Almost coming to a month, the Brooks Run Happy @ Marina Square has been seeing runners from all parts of Singapore coming down for a scenic group run along the riverside, with a fun and light-hearted bunch, led by the Team FatBird “Run Happy” Guides. Run Happies get to trial the current range of Brooks running shoes like the Pure Project series, the comfortably cushioned Adrenaline and Glycerine, and even the speedy GT racer series (if you are in luck). Post-run drinks and baggage drops are provided, and best of all, the run is free to join..TGIF! SIGN UP for the run & Brooks Shoe Trial! Join us every Friday for some Run Happy! 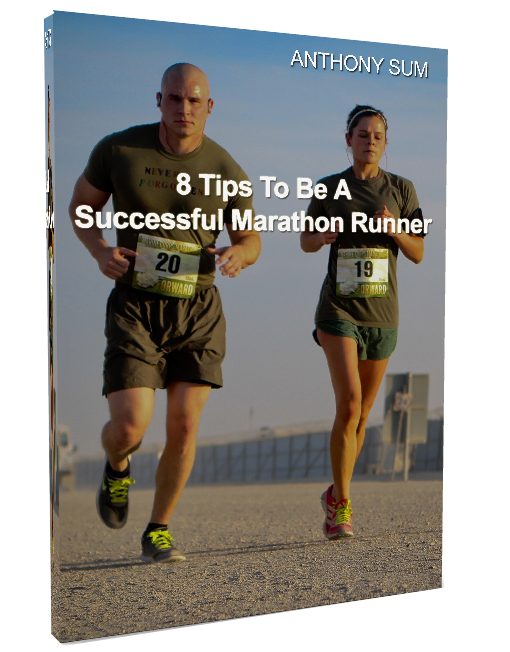 Are you looking for a tried and tested training program to help to meet your targets at THE MARATHON? 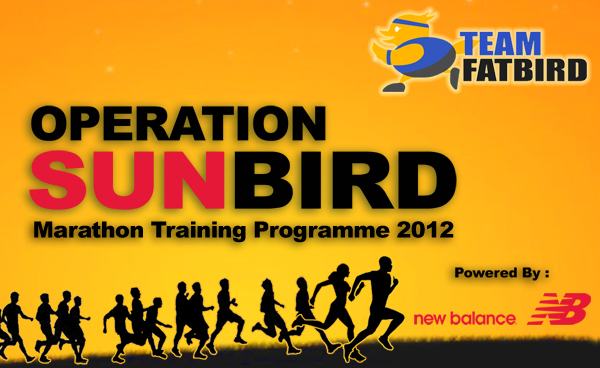 To support your marathon training preparations for the Standard Chartered Marathon Singapore (SCMS 2012) and other year end international marathons, Team FatBird is pleased to announce the popular and effective training program of strength and endurance – Operation Sunbird 2012 , 12-week FlightZONESTM structured Marathon training program. Operation Sunbird is a 12-week FlightZONES marathon training program to prepare runners to compete and complete the year end marathon(s). + Ops Sunbird will not come packaged with SCMS race slots. Please register for your personal SCMS race slots soon to take advantage of the priority and early bird pricing. ++ As NBRR 2012 is incorporated as part of this training program, you will be offered discounted registration fees for NBRR 2012 if registering through us. 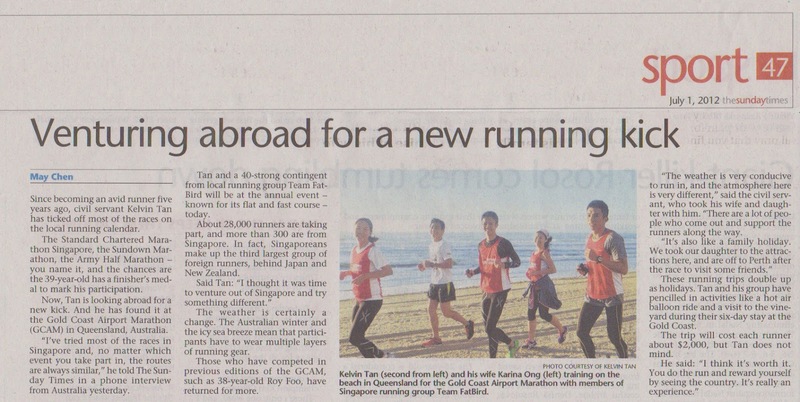 The Operation Kookaburra (Team FatBird) runners had a very good outing at the Gold Coast Airport Marathon (GCAM12) in spite of the warmer winter temperatures compared with previous years – with many of you scoring massive PBs and achieving stretched targets. Hearty congratulations go out to Team Singapore @ Gold Coast Airport Marathon 2012 and Team FatBird Runners whose hard work at training have paid dividends, and even the few who did not manage more-desirable finish timings, your acts of perseverance and team spirit shone through on race morning. You have rocked GCAM12, and now its time to PARTYYYYYYY!